Work could begin on a new civic centre in Surrey in a year's time after a £19.5m scheme was approved. 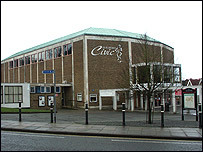 The Guildford Civic, the town's arts and entertainment venue, was shut in January 2004 as the borough council worked on ideas for how to improve it. Two developers have come and gone since 2001, but now a 1,000-seater new building is set to be constructed on the existing London Road site. Consultants will now be sought for a planning application to be submitted. Guildford Borough Council's executive committee gave the go-ahead for the new building at a meeting on Thursday night. 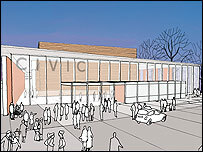 The decision was made in order to have a new civic hall built "as quickly as is achievable". The council said that once planning permission had been obtained, a contractor could be ready to start work on the site in late spring 2007. Spokesman Jim Miles said: "We can now concentrate on producing the high quality replacement which the community deserves, at a realistic cost." Consideration had been given to a proposal from the University of Surrey to replace the Guildford Civic with "an even better facility" at its Stag Hill campus in the town. However, council chief executive David Williams said: "Given the feedback from the public who have said they want the venue to stay in the town centre, councillors decided to support the new-build option on the existing site."